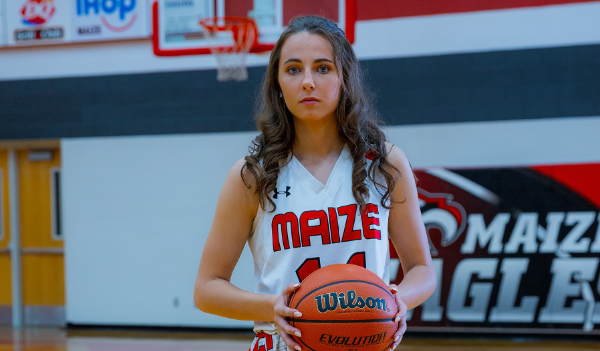 Halie Jones has helped Maize to a #3 ranking in 5A. Derby standout Kennedy Brown enjoyed a big showing at the Glacier’s Edge tournament in Emporia and became the first Kansan from a sanctioned high school to earn an invitation to the McDonald’s All-American game. The 11-0 Panthers and Bishop Miege have strongly asserted themselves as the state’s best teams. Derby defeated Topeka Seaman, 66-27, in the final. Brown earned tournament MVP honors with 16 points in the championship. Tor’e Alford had 14 and Sydney Nilles tallied 15. In the semifinals, Derby beat Wichita Northwest, 55-26. Brown sunk five treys and tallied 29 points. In the tournament opener, Derby defeated Shawnee Mission North, 65-17, as Brown had 17 points. Derby and the Liberal girls are the only undefeated teams in Class 6A girls. Liberal, which shifted three spots to No. 2 this week, defeated Hugoton, 52-31, and moved to 12-0. Junior Machia Mullens had a huge performance with 25 points on 12 of 19 shooting. Standout Katie Horyna didn’t play in the contest. Mullens also had five rebounds, three blocks, three steals and two assists. Freshman Nijaree Canady of Topeka continues an impressive season with 20.5 points per game this year. Tymer Jackson has been an outstanding scorer this season for Olathe North in 6A. He has averaged 25.5 points per game in 2018-2019. He also had a 47 point game earlier this season. KT Raimey also averaging over 18 points per game for the Eagles. Keenan Miller of Wichita South is having a big year for the Titans in which he is averaging 21.5 points per contest. He's also picking up around six boards per game. In the El Dorado Lady Cat Classic, Maize South enjoyed a great tournament with a semifinal 57-40 victory against Augusta and a 67-17 win versus ranked Mill Valley in the championship game. Maize South gets a huge league game at Goddard on Tuesday in a matchup of Class 5A girls’ last two perfect teams. Senior Lexi Snodgrass had 16 points, and senior Zayda Perez, the tournament MVP, scored 10. Maize South captured the championship for the first time. Maize South stands fourth in 5A, and Mill Valley is seventh in 6A. In the McPherson Mid-America Classic, the host Bullpups defeated previously unbeaten Olathe South, 49-37. Manhattan finished in third place over Ulysses, who is ranked No. 8 in Class 4A. McPherson has won back-to-back titles. Olathe South, which had long had success in the tournament, had defeated the Bullpups five straight times. McPherson is sixth in 5A, and Olathe South stands fifth in 6A. Maize, paced by tournament MVP Sydney Holmes, won the Lawrence Firebird Winter Classic tournament and remained with just one loss, against Derby. The Eagles play rival Maize South on Friday in a huge matchup. In the tournament, Maize defeated host Lawrence Free State in the semifinals and then beat Blue Valley Southwest, 60-53, in the championship game. Holmes had 16 points in the title, while Alexis Cauthon and Halie Jones also earned all-tournament team recognition. Maize is third in 5A. Kael Kordonowy of Maize South is having a huge season in averaging nearly 18 points per game while pulling down a state leading 13.6 boards per contest. He's also averaging 3.4 blocks per game. Maize South is 9-3 on the year. The Wichita Heights pulled off a signature win the finals of the Lady Thunderbird tournament at Shawnee Heights. In the finals, Heights defeated previously undefeated Washburn Rural, which was ranked second in Class 6A. Heights, which has only lost against Derby, beat WR, 68-62. Heights battled back from a 7-0 deficit. Sophomore Laniah Randle tallied 19 in the title for tournament MVP honors. Junior Taylor Jameson tallied 22 points and Zyanna Walker had 12 points. Jameson and Walker were also picked to the all-tournament team. Heights is again fifth in 5A girls. Washburn Rural’s Carly Bachelor had 36 points and 15 rebounds in a phenomenal effort as Heights ended WR’s 14-game winning streak, including a 13-0 start this season. Bachelor, who has inked with Creighton University, also picked up all-tournament team accolades. Rural dropped from second to third in 6A. Arkansas City’s Cevin Clark leads the state with 31.1 points per game and is shooting 85 percent from the free throw line. Clark could challenge the state record of 240 free throws set by Ottawa’s Semi Ojeleye in 2013. AC is up to third in 5A, a spot above last week. Salina Central boys won at Hays High, 52-39, behind 15 points from Harper Williams and 11 by Mark Grammer. SC is seventh in 5A. Olathe West had a nice showing at the Lawrence Free State tournament. Michelle Anderson earned the team’s Black Shirt Defender award with a collective 41 points, nine rebounds and six steals in the three games. Sophomore Bailey Collar collected all-tournament team honors. Olathe West defeated Hutchinson, 59-50, for fifth place and captured two wins at the tournament after it entered the competition with just two victories this season. OW, in its second year as a school, went 6-15 in its first season with coach Kristine Williams and is 4-7 this year. Hays High girls earned a quality home win, 73-65, against Salina Central, improved to 8-3 and moved into this week’s Class 5A poll for the first time at No. 10. SC dropped to 7-4. Savannah Schneider tallied 26 points for the Indians, and Jaycee Dale had 15 for the experienced Indians. Three headed monster: Andover Central has three players averaging 16 or more this season in Xavier Bell (19.6 ppg), Braden Belt (19.5 ppg) and Easton Leedom (16.6 ppg). Leedom also averaging over six rebounds, six assists and two steals per game. Jags are ranked #2 in 5A after moving up to the classification this year. Kade Hackerott of Goddard continues an impressive season in which she is averaging 18.1 points per game for the Lions in 2018-2019. Jordan Vincent of Goddard-Eisenhower has picked up right where his brother Dylan left off. Averaging just over double figures as a sophomore he has taken his game to an entire new level as a junior in averaging 23.8 points per game this season. Keyon Thomas of Bonner Springs (11-2) is averaging 21.1 points per game this season for the Braves. He also distributes well with 4.4 assists per contest and is a takeaway machine on defense with 4.5 steals per contest. Thomas also pulling down aroudn four rebounds per game in 2018-2019. Caleb Grill continues to lead Maize, #1 in 5A, to a solid season. The senior multiple sport star, headed to South Dakota State to play basketball, is a very balanced player. He is averaging 18.4 points per game along with 4.4 rebounds, 3.1 assits, 2.1 steals and 1.1 blocks. Grill is having a player of the year type campaign in the classification along with the likes of Cevin Clark. 5A has some players in 2018-2019. Maize is currently 13-0. At the Eli J Walter tournament at Berean Academy, Wichita Trinity girls captured the crown against Halstead with a 62-58 title victory. Trinity defeated previously unbeaten Hutchinson Central Christian and one-loss Halstead to earn the title. Winfield captured the Mulvane Wildcat Classic with a 41-36 victory in the championship game against Conway Springs. Emily Randall had 28 points in the title contest. Labette County girls collected an overtime win against Parsons last Friday and stand No. 6 in Class 4A with a 12-2 record. LC graduated 2,000-point career scorer Tristan Gegg. Kristi Snider is one of the most consistent coaches in 4A. Bishop Miege girls captured the Newton tournament with a 60-40 win against Olathe Northwest and remained undefeated and No. 1 in 4A. Ashton Verhulst, who has committed to Kansas State, delivered 21 points and nine rebounds. Payton Verhulst, her sister, paced the team with four assists. Miege limited ONW to 25 percent shooting and forced 16 turnovers. Miege had just four turnovers. Ashton is averaging 12 points and 4.6 rebounds a contest this season, and Payton is at 15.7 points and 5.5 rebounds. In a high-profile matchup, Baldwin defeated Nemaha Central, 47-46, in the final of the Wellsville Top Gun tournament. NC was ranked first in Class 3A but stayed atop 3A in this week’s poll. Baldwin is fourth in 4A. Wamego's record hasn't been great this season but T.J. Fritz has. He's averaging 22.8 points per game in a breakout senior campaign. Fritz, a 6-foot-2 senior, is averaging 5.4 boards per game as well. He comes from a very athletic backgorun in which his dad, Steve, is a former Olympian in the decathlon, while mother, Suzie, is the head volleyball coach at Kansas State. He was featured earlier this season on Faces in Kansas. Haven enjoyed a great championship as the host in the Wildcat Classic, nearly one year to the day after assistant coach David Chamberlain passed away. Haven, which bumped up a spot to No. 2 in Class 3A, defeated back-to-back previously undefeated teams in Nickerson and Cheney. Haven captured a midseason tournament crown for the first time in six years. Aalyiah Negonstott is looking like one of the top girls players in this class with a 19.7 points per game average for Jeff West in 2018-2019. Two seasons ago they took second in 4A-II. Faith Paramore had 24 points in the title game and earned All-Tournament team honors. Paramore had 32 points in the semifinal game versus Nickerson. Haven captured both victories by double figures. Haven bumped to 10-2. The tournament had a stacked field that also included ranked team Rose Hill. Norton girls moved up four more spots this week in the Class 3A poll. In the last four polls, Norton has gone from unranked, to No. 10 to No. 7 to No. 3. After the Bluejays captured the Mid-Continent League tournament championship, the Bluejays squelched Goodland, 44-23, on the road Friday. Norton is 12-1 and has still not lost to a Kansas school. The Bluejays are the only 3A team that has not fallen to an in-state school. Norton has a challenging week this week with versus Colby (8-4) on Tuesday and then at Thomas More Prep-Marian (10-4) on Friday. In the Goodland victory, Taryn Kuhn had another big victory with 17 points and went a perfect 7 of 7 from the free throw line. Phillipsburg boys continued to roll and is now sixth in 3A. The 11-2 Panthers defeated Oakley, 58-37, behind a balanced effort. Trey Sides tallied 14 points, Ty Sides scored seven. Nathan Moon, who is also a starting wrestler for the Panthers, had nine. Phillipsburg girls continued its big turnaround with another close win with a 44-41 win against Oakley. The Panthers are 8-5, including two losses to Central Plains and one to Norton, teams that have not lost to Kansas schools. Phillipsburg has captured wins by one point, two points, three points and seven points – including three victories against Plainville. Junior Kristen Wells paced the Panthers with 15 points, and Oakley’s Jordyn Lowrie delivered 13. Baxter Springs senior Trey White went over 1,000 career points and has cleared 20 points per game in the last two seasons. Baxter picked up a key victory over then 3A #1 Girard on Tuesday. TMP girls moved to 10-4 with two quality wins in the last four days. Last Friday, the Monarchs had a superb defensive effort against Abilene in a 44-35 victory. TMP had a 15-0 run in the third quarter and limited the Cowgirls to just 30 percent shooting overall. Abilene is still ranked fifth in Class 4A. Senior Emily Schippers had a big game with 16 points and senior Jillian Lowe and sophomore Kyleigh Allen paced an excellent defensive effort. On Monday, the Monarchs picked up a win at Smith Center in a road makeup game, 57-41. TMP outscored Smith Center, 18-6, in the third quarter. Sasha Wasinger, a reserve post, had a breakout game with 14 points, and freshman post Emilee Lane tallied 13. Lowe scored 12. Haven sub-state for 3A boys is absolutely loaded with defending champ in the field. Hesston, Cheney, Kingman, Belle Plaine, Haven, Halstead, Chaparral, Collegiate are all in the field, those are ranked by record. Worst record is 7-5 by Collegiate while best record is 11-2 by Hesston. Seven of the eight teams have a t least eight or more wins and four teams are 10-3 or better. The 3A boys sub-state at Caney Valley also has some serious contenders. Anyone can beat anyone in the field. Girard is the one seed, while Baxter is the two seed. Both are ranked and Baxter beat Girard last week. Also, within that field are Riverton, Cherryvale, Caney, Galena, Columbus and Frontenac. Columbus is a seven seed currently in that sub-state and has beaten Baxter to give you an idea how much parity there could be in this. Frontenac is also an eight seed that has played much larger competition this year with a deceiving record. Majority of these schools will be tested and it will be a gauntlet. Of course Baxter, led by Trey White and Kyler Reece, may be the favorite along with Girard, led by Caleb Muia, but anyone has a shot. Sedgwick captured its own tournament with an upset victory against Inman in the Steve Shepherd final. The unranked Cardinals defeated Inman, 40-35, which is No. 3 in Class 2A. Sedgwick improved to 7-3. WaKeeney-Trego girls are up a spot to No. 3 in Class 2A. The Golden Eagles defeated struggling Hill City, 57-25. WaKeeney has lost just twice, on a last-second 3 at TMP and in overtime to Norton in the Mid-Continent League tournament. Lili Shubert finished with 13, and Libby Frost had 14. Northeast-Arma is seeing a lot of success this season, especially with the scoring of Tre McLaughlin. He went for 33 in last weeks win over St. Paul. Vikings are 6-0 in their league and are 11-3 overall. They will have a legit shot at a league title in the TRL this year but still have a very solid Yates Center, led by star player Aaron King, on their schedule. Both are also part of a very solid sub-state in Arma with 2A power St. Mary's Colgan in the field. Hats off to Russ Cramers bunch for a nice season so far. Oswego’s Paidon Kite has made 39 of 65 (60 percent) of his 3-point attempts. The state mark is 61 percent set by Brewster’s Jordan Reid. Hutchinson Trinity’s Kaleb Hammeke cleared 1,000 career points. Trinity Catholic bumped two spots in Class 2A from eighth to sixth this week. On Monday, Trinity defeated Smoky Valley, 50-46, in a makeup game. Joshua Bridgewater, Trinity’s 6-9 post, had seven blocks. Hammeke tallied 14 points as the Celtics improved to 9-3. In a slight upset, Smith Center boys defeated TMP, 66-58, on Monday. The Redmen earned their first MCL victory this year, and the Monarchs lost its third in a row to drop to 8-7. Griffin Kuglar led SC with 21 points on 11 of 12 free throw shooting for the 3-8 Redmen. He was averaging 5.8 points per contest. SC led by double digits the majority of the contest before a furious late run by the Monarchs. The Redmen had lost 65-59 to TMP 17 days prior. SC was 0-6 against the Monarchs in boys’ basketball since TMP joined the MCL in the ’14-15 season. Aubree Dewey continues to light it up for Plainville as she is averaging near the top in the entire state at 28.5 points per game. She is one of the top small school players in the state. Jax Holland of Maranatha Christian is lighting it up this season with a 23.8 points per game average. He's a complete player with 7.8 boards and 4.2 assists per contest. The 6-foot-2 senior has led his team to a 7-5 mark so far in 2-18-2019. Tanner Halling of St. John is enjoying a nice season with 18.4 points per game. The 6-7 junior has led his team toa 10-3 record this season and also averages 3.8 blocks and 7.6 boards per contest. Waverly coach Mike Hevel, one of the state’s all-time great coaches in football and basketball, was honored in his final Lyon County League tournament contest. The game was his 1,000th of his career. Hevel has spent 43 years at Waverly with four state basketball titles and 650 basketball wins. Hevel also captured two eight-man state championships. Central Plains girls and Emily Ryan continued another remarkable season with its sixth straight Hilltop Classic championship at Barton County with a 60-19 championship game win against rival St. John. CP outscored SJ, 22-0, in the second quarter. Central Plains have now won 97 straight contests. Against Macksville last week, Ryan nearly set the state record for steals in a contest when she had 17. Rachel Lamatsch was the 3-point champion, and Ryan was the free throw titlist at the tournament. The Southern Plains Iroquois continued its banner season with an outstanding league tournament at Dodge City’s United Wireless Arena. In the boys’ championship, Coldwater-South Central upended Montezuma-South Gray, 61-60, and ended SG’s 39-game winning streak (including a bye last year). SG had defeated SC by 10 earlier this year. South Central trailed 15-2 early. Owen Alexander had 20 points and played solid defense against SG standout Clifton Miller, who had just two second half points. The T-Wolves made eight 3-pointers. Junior Xavier Frazier made the game-winning shot inside with 7.5 seconds left. In the girls’ championship, South Central captured its third straight league title with a 44-40 win against South Gray. Senior Bri Rutherford delivered 21 points and seven steals. Freshman Hadley Lohrding, in her first career start, had six huge fourth quarter points. She scored underneath off a pass from Rutherford, and then had a steal and breakaway layup. Lohrding sunk a pair of late free throws. The game was in doubt until the final seconds when Rutherford made a free throw to make the contest a two-possession game. The interior play matched two acclaimed players with South Gray’s Hannah Askew (15 points, 11 rebounds) and South Central’s Jordyn Jellison (13 points, eight rebounds). SC, with just two losses, moved up a spot from eighth to seventh in 1A. Kiowa County girls, paced by Brecken VandenHoek and Sabrina Thomas, earned third place. KC avenged earlier season losses to Spearville and Bucklin and defeated both teams in the tournament. The Mavericks were the No. 8 seed. VandenHoek has delivered another all-state caliber year, and Thomas has put up double-doubles after she was not available to play the majority of last season. In the third-place boys’ game, Hodgeman County defeated Kiowa County, 64-50. In a key 1A matchup in both boys and girls, Otis-Bison swept Sylvan-Lucas. In the boys’ contest, O-B won 55-29 after trailing 12-9 following the first quarter. The Cougars outscored the Mustangs, 15-2, in the third quarter and 18-5 in the fourth quarter. Anton Foust delivered 17 points, and Maitland Wiltse scored 15. O-B girls, ranked No. 9 in 1A, defeated Sylvan-Lucas, 53-36. The Cougars moved to 13-1 before its matchup against Central Plains on Tuesday. S-L boys are 9-2, the girls are 8-4. Northern Valley boys beat rival Logan, 69-33. Sharpshooter Ross Cole paced the Huskies with 17 points. Riley Sides, who averages 17 points a contest, scored 14. Fabian Loya had 14 as well, well above his season average. NV is up two spots to No. 4 in 1A. Canton-Galva’s Tia Moddelmog and Alexa Bell earned all-tournament honors at the Sedgwick tournament. Golden Plains girls have quietly put together a great year and remain undefeated at 13-0 entering the Western Kansas Liberty League tournament this week. GP, ranked No. 10 in 1A girls, defeated Triplains-Brewster, 59-16. Kaycee Miller paced the Bulldogs with 13 points. Thunder Ridge girls are starting to roll with seven straight victories and haven’t lost in January. The Longhorns are 10-2 and defeated Southern Cloud, 64-29. Jaden Boden had 18 points, while Layne Pettijohn had 15 points. Conner Havlas of Quinter, featured on Faces in Kansas in the preseason, is having a big senior campaign. He is 11 double-doubles this season in 13 games. That is the most double-doubles in 1A this season reported. While the team has struggles to just three wins, he is averaging 20 and 12 a night for the Bulldogs.